Chicago White Sox rookie slugger Jose Abreu last weekend last weekend went on the 15-day disabled list with an ankle injury. While this two-week sabbatical may not be a big deal early in this season, missing 14-15 games may be a big deal when we look back at Abreu’s season in early October. Abreu has slugged 15 home runs in his first 44 games this season. That works out to a pace of about 55 home runs for the season if Abreu had not missed any games. Only one rookie has hit more than 40 home runs in their initial season: Oakland A’s rookie Mark McGwire had 49 HRs in 1987 in his first season in the league. In fact. McGwire is the only rookie to hit 40 or more home runs in a season. Looking back, we see that 25 rookies have hit 30 or more home runs in a season. Of those 25, 14 were selected as Rookie of the Year in their league that season. The last rookie to hit 30-plus HRs was in 2012 when the Angels Mike Trout hit 30. Here’s a look at the rookies who have hit the most HRs in their first season in the league. Of the 11 players above, seven were selected as Rookie of the Year that season. Abreu’s 15 HRs this season already places him 13th on the White Sox all-time list for HRs by a rookie. The team record in Ron Kittle’s 35 in 1983. 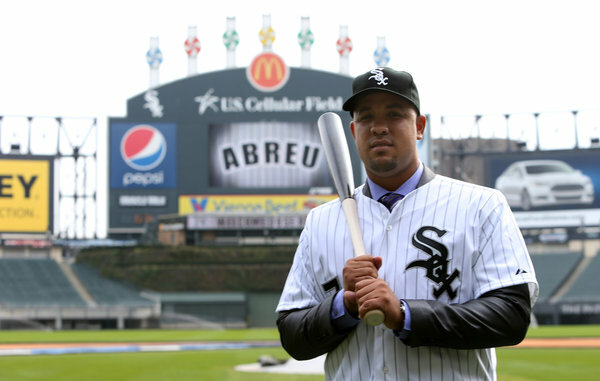 Will Abreu make a run at McGwire’s 49?